At the end of the 2015 wrestling season I went to work while gather input from present and past coaches to put down 25 top moments that team Fauquier wrestling had endured. Five years later the list has grown to 43 Greatest Moments and Achievements. The 2018-19 wrestling season had team Fauquier going 13-12 while holding a 3 and 3 record in the Northwestern District. These in-season duals might have tested the Falcons but once the post season came around, Fauquier showed all that the Northwestern District and Regional Championship crowns belongs to Fauquier Nation. Reviewing these district box scores of the in-season dual matches, one can most certainly see a parallel of the NW District teams. Most dual matches came down to the final wrestling bout win or lose that decided the team’s outcome. No huge advantage or dominations of any team during the 2018-19 campaign. Yes, this may NOT had been the case from 2006 to 2009 seasons when Fauquier rest in the Cedar Run District and it only comprised of four to five wrestling teams. Let’s be honest, foe district teams then really were not that good compared to the NW District teams of today. One of the difference now is the Northwestern District is made up of a seven team field all having strength verse the quality of wrestling in the district, 10 years ago. Not to indulge about next year but the Northwestern District will increase by one team going to an eight teams for the 2019-20 season. While the 2019 4A State Championship results alone had three Fauquier County schools holding down the 3rd, 4th, and 6th team placement respectively alone should also prove to show that simply advancing out of the NW District Championship is a huge accomplishment. Question for Coach Fisher: Words on the strength of the 2019 Northwestern District. Coach Fisher: "The Northwestern District was without a doubt the best District in the 4A state, and I see that continuing for the foreseeable future." The sustainability of a coaching staff that continues to work together could be a reason for these great achievements over the past 10 plus years. For the athletes to buy into a wrestling system that continues to win post season events, makes for mat side moments no matter what in-season record team Fauquier has had. Winning eight Regional Wrestling Championships since 2010 is a huge accomplishment and feel all eight should be loaded on this Greatest Moments list. But, we will have to wait for future years to insert all and do look to the past and the first ever Regional title for team Fauquier to show up alongside two others new moments, taking the list from 40 in 2018 to 43 achievements in 2019. It’s hard to compare past Fauquier teams against each other and that’s not the purpose of this list, just those outstanding and over the top remarkable instants in a season that’s worth remembering. With three newly added Moments and Achievements I am going to work backwards with the lowest and newest event to the best of 2019. Below are these Moments and Achievements. New 37. Team Fauquier down by one point during the 285lb 3rd place Championship Finals as Thomas Heisler earns a 3rd period pin and win to edge out Liberty HS by 3 points 201 to 198 to win the Northern District Championships. Team Fauquier advanced 12 wrestlers onto the 4A Regions - 2019. Fauquier continues to roll into the post season peaking at the right time to win its 14th District Championship. From outside you may think it’s easy for team Fauquier - I completely disagree. Looking back over the past three years its simply has been team Fauquier and Liberty HS. battling for the district crown. Factoring in the Frederick Co. schools to the equation it’s has become a meat grinder of a post season. The Falcons placed 12 wrestlers (2-1st place, 4 – 2nd place, 2-3rd place, and 4-4th place) to hold off Liberty by 3 points. One of the reasons this makes the greatest moments list and could be one of my best moments of 2019 was how this district was won. Yes, full team effort but a remarkable finish heading into the 285 lbs. final bouts. Team Fauquier holding a 17.5 points over Liberty going into the Championship Finals, Liberty made a final round charge to shrink and take the lead going into the final bout of the night. While Thomas Heisler of team Fauquier ended shortly their after with a win and pin having the Falcons jumping the Eagles in a classic ending to the 2019 NW District Championships. Question for Coach Fisher: What was it like to win the 2019 District Championships – any reflections on the team NW District Championship. Coach Fisher - on #37: "It is always more exciting when the title comes down to the last matches. This one was certainly one of the most exciting. It was a great team effort." Noting that the 2009-10 season was before Coach Fisher took over the Fauquier wrestling program as he was the Co-Coach with Steve Friend. There was no Fauquier website back then and surely Fauquier did not have any social media apps. The 2010 wrestling post season had team Fauquier winning its 5th straight District Championships en-route to its first ever AA Region II title and a third place finish at the AA states that same post season. Generally, when a wrestling post season event has a field of a 16-man bracket, most events will run a two-day event. While the Northern part of the Virginia was hit with heavy snow storm days before had schools being canceled leading up to the this region event. The host site Jameswood HS. was not prepared to run the Region II event on Friday pushing the tournament to a one-day event that Saturday and Sunday. While the VHSL allowed the Region to take place on Saturday and Sunday it turned into a 17-hour marathon lasting well into 2AM Sunday night. Reflecting back and having a post season event lasting well past mid-night and into Sunday seemed completely crazy then and still does today. As the weather can be so unpredictable in our region of the state, I surely remember thinking that this was unreal, how can these wrestlers be able to compete during this time of night. Having five in the district finals with four champions this was also a time where we saw two forfeits in the 130 lbs Championship Finals. Clearly the first time I have ever been witness not crowning a winner in a post season weight class. While the VHSL had gone public with the state seeds the week before both the Fauquier and Brentsville wrestlers opted out to not wrestle, causing mayhem to the Virginia State brackets. Team Fauquier had finishing second place in the Region the previous two years, Fauquier showed strength to win the 2010 Region Championship for the first time in school history. Question for Coach Fisher: Being part of the Fauquier coaching staff in 2010, can you reflect on the team winning its first Regional Championship? Coach Fisher - on #19: "That was certainly the craziest Regional Tournament that I was ever involved in. I hope that never happens again. I’m also glad the VHSL went back to not publishing the matchups prior to the State Tournament because when they are published prior, it invites this kind of unfortunate forfeitint chicanery." Sam Fisher contribution to the team this season and past is one reason why Fauquier wrestling continues to have much success. Wrestling in the 2018 Iron Man and placing 6th very well could be classified on the Greatest Moment list. But to be the second wrestler to win the third state championship shows that Sam Fisher is one of Fauquier County best wrestlers ever. A junior, Sam went 44-6 for the 2018-19 season and currently holds a 127-18 career record which is an 87.59% winning percentage. Fisher currently rest in 15th with the all-time most wins and 6th in winning percentage. With another season still to come we all should expect Sam to move up the charts. Fisher has verbally committed to Virginia Tech and is expect to be setting spring, summer, and fall goals to aggressively continues to train and compete on the national level. 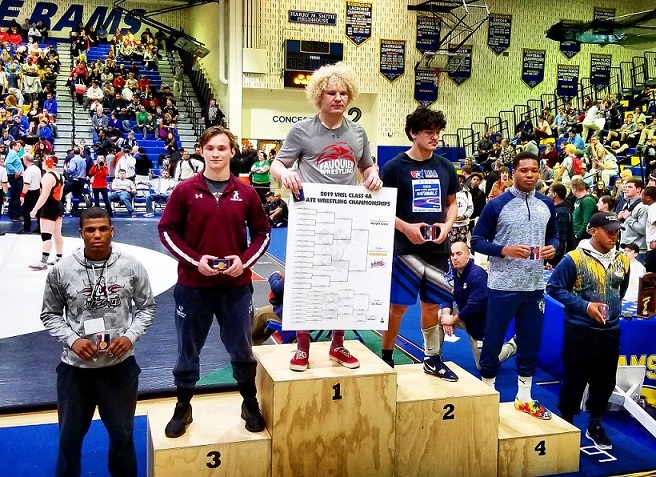 Question for Coach Fisher: Clearly pound for pound one of the best Virginia wresters in the Robinson gym this past February at the 2019 4A, 5A, and 6A and State Championships. What Sam Fisher has done in his past wrestling career most certainly reflects this current achievement. Can you speak to us about Sam? Coach Fisher - on #4: "Well, Sam has certainly contributed to Fauquier’s most recent success, but it is Fauquier’s tradition of excellence that has significantly contributed to Sam’s success. Sam would not be close to where he is without the myriad of amazing wrestlers, coaches and support staff that have been associated with the program. Guys who trained with him early in his high school career included wrestlers Garrett Tingen, Matt Raines, Franco Camarca, Caleb Strum, and Kevin McEachin in addition to coaches Chris Thomas, Tyler Atwell, and Kris Bishop. Previous year’s team captains like Kyle Budd, Joe DelGallo and Ty Foster set the benchmark and expectations for hard work and high standards which facilitate the success of the next group in which Sam is now part of. As hopefully the cycle continues, Sam can help the next group of Fauquier wrestlers achieve their goals of District/Region/State individual and team titles."